These were taken with my old Canon Rebel XT + 70-300mm zoom -- *NOT* with the little Canon SX260. This set is included also in Canon SX260 galleries that have the other zoo visits to avoid confusion when navigating zoo sets. 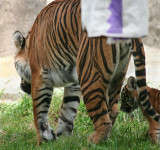 ADDED latest photos of the tiger cub at 6 months of age now, in a Facebook Album Log (August 2013) until I can put them here later. They're viewable in large thumbnails there so that you don't need to click through for larger photos to get a sense of the visit, and this link works for NON-Facebook members too, no need to join. Here's a Flickr photography discussion about trying to get clear pictures thru' the zoo's plexiglass windows in the tiger exhibit), which is why the effort to find fence views. To see the images that are 1024 pixels wide (or larger) for the thumbnails below, *click* on 'ORIGINAL' option below the first photo that comes up after you click on a thumbnail; otherwise, and that setting will stay for the session. It defaults to 800 pixels wide.